RRP £88.00 You need to apply the 10% discount code for this price which is on the page link. I was looking for a good electric rechargeable toothbrush and I come across this one its #1 Best Seller In Sonic Toothbrushes on Amazon and its the best price I can find. It also has a Philips 2 year guarantee, Longer battery - up to three weeks use on a single full charge. HX6511/43 £30.99 on Philips site, 10PHILIPS, 25TIMESTHANKS, takes 25%+10% off, 8% Quidco. RFF35PHILIPS,10PHILIPS takes 35%+10% off shavers but not toothbrushes. Works on toothbrush heads also. HX6511/43 £30.99 on Philips site, 10PHILIPS, 25TIMESTHANKS, takes 25%+10% … HX6511/43 £30.99 on Philips site, 10PHILIPS, 25TIMESTHANKS, takes 25%+10% off, 8% Quidco.RFF35PHILIPS,10PHILIPS takes 35%+10% off shavers but not toothbrushes. Works on toothbrush heads also. Strange still showing in stock for me, I think the /43 at the end applies to the toothbrush head it comes with. Strange still showing in stock for me, I think the /43 at the end applies … Strange still showing in stock for me, I think the /43 at the end applies to the toothbrush head it comes with. Sorry my mistake the HX6511/50 is out of stock on Philips site. great! i used to have one of these but after a few years battery went so i got a cheap oral b 600. but would buy again at this price! The difference between the 2 toothbrushes is only the brush head, the HX6511/43 for £30.99 has DiamondClean standard head the HX6511/50 has ProResults standard. Where do I find the 10% discount code ? 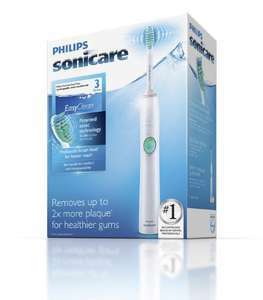 The REF35PHILIPS code works on the more expensive range of toothbrushes. Is the 10PHILIPS code for Amazon or the Philips site? Can't seem to get it working on Amazon. Is the 10PHILIPS code for Amazon or the Philips site? Can't seem to get … Is the 10PHILIPS code for Amazon or the Philips site? Can't seem to get it working on Amazon.